LightCity: Using FengShui and Physics to Design Life Back In To Cities..
Live Birds only go to places where magnetic lines create symmetric nest like patterns. 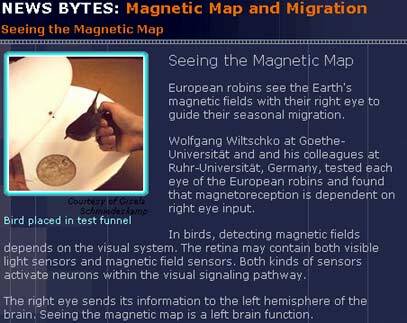 Glands like the Pineal and Pituitary in humans - have been shown by dowsing research - to respond to magnetic lines very much like birds. (Reference: Good Feng Shui When Scientists Cross Ley Lines With Dowsers? ) We steer well if the local magnetism is nicely arranged .. like a rose if you will. We tend to get dizzy and disoriented more quickly if the local magnetic lines are scrambled - in the same way funny film clips show how birds get lost in certain hilly areas where magnetism creates a tangled knot. One of the many lessons we might quickly learn - with a visit to the American Dowser's annual, in Danville, Vermont, USA - is that virtually every dowser is firmly convinced that Traffic pattern 'Black Spots' (High Accident Risk zones) are almost ALWAYS caused by places where the local magnetism is totally screwed up. And most of the dowsers there - will tell you in no uncertain terms how to fix such things! Magnetism arranged in a certain symmetry that looks like a rose ('fractal' or 'self-similar') is KEY to making ATTENTION itself possible - so of course this will affect the driver AND your city. The lessons here for the town planner are profound - AND practical. If centuries of Feng Shui, Dowsers and Geomancers and 'Grid Engineers' are right about ley lines and Earth's telluric forces - then the way to create a city ATTRACTIVE to tourists and visitors - may start with the process of arranging magnetic lines. A few basic understandings of the physics and science behind what makes magnetic line hygiene absolutely critical to getting the FEEL right to a city - can be surprisingly simple and powerful. The 'storal to this morey' about magnetism - is that certain structures literally allow magnetism to BECOME ALIVE - while other structural materials - literally BLEED ALL OF THE LIFE FORCE out of the local magnetism. If our building and city planners would just take a few basic lessons about how to keep space alive electrically - it could potentially actually revitalize urban areas quite quickly. This is not just old fashioned sentimental poetry about FengShui for coffee table magazines. This is the physics of measuring seed germination rates after an improvement in braiding and coherence in their magnetic environment. Our research group after years of intense study of the electrical qualities of what creates life - has actually come up with a radically new way of defining and measuring .. AND CREATING LIFE! So this all sounds like fun - (ultimate parlor game - whose lover is most loving?!?!).. and it is fun .. but what does this have to do with city planning?? Well - it turns out that the simple idea - now embraced by medicine - that HARMONIC RICHNESS , or HARMONIC INCLUSIVENESS - (which happens when COHERENCE is also based on Golden Ratio .. see IMPLOSION PHYSICS) predicts VIABILITY -- (how long you will live) .... can be applied to ANYTHING ALIVE.. In other words - you can measure ANYTHING electrically - and determine how alive it is! We do this be sticking the tomato or egg or....ANYTHING ... in to a capacitor in a clean magnetic place - and checking how many harmonics of CHARGE are present. This process measures life because it measures how many different waves of charge information the living thing is able to attract. In GOLDEN MEAN ratio - the number of harmonics of electrical charge able to agree to meet - becomes infinite. This is part of why - Golden Ratio ( phylotaxis ) is basic to all life. Please read about our new technology to measure and teach how to create life - by creating electrical environments - works - at: HARMONIC INCLUSIVENESS OF CHARGE-Can Life Force Be Measured in Capacitive Terms? Well - the fun part is that we CAN - apply this new physics to making LIFE return to a city - DIRECTLY! Imagine - inputting the harmonic analysis of a whole bioregions magnetic and capacitive fields - to check to see if a bioregion is healthy. And then FIXING it - by replacing missing haromincs. ('Musical Recipes for Peak Experience') .This is quite similar to the way a forest can be checked for health by the harmonic inclusiveness of the sounds in the canopy! ( read - DESERTIFICATION, Patriarchy and "Hard-Making Power; why hugging creates rain: it columnates magnetism..
and read - BioAcoustic Habitat Theory: Forest Makes A Membrane (Immune System) by Braiding Coherent Sound Layers.. 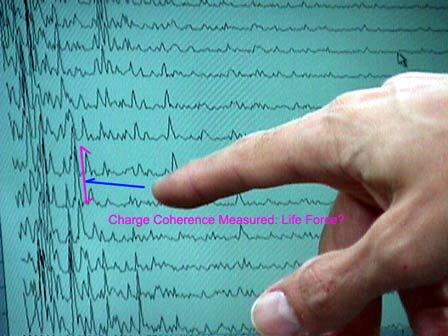 Some of you may have been impressed where the book Celestine Prophecy said: "All human interactions are about CHARGE". Well - if you want to be IN CHARGE of re-vitalizing a city - there are some things here you may well use. One of my early teachers - Buckminster Fuller was famous (among other things - than "BuckminsterFullerene" geodesics) for studying the relationship between - places on the Earth where many magnetic lines crossed - becoming INVARIABLY the places where human cultures chose to BUILD CITIES. In other words - cities happened in the first place - because people - just like ants and bees and birds and most animals - will always naturally congregate in areas where magnetism crossed recursively in pretty rose like patterns. This was natural - because in the places where magnetism does NATURALLY make pretty patterns- there all of biology grows better because the electrical force it takes to organize water into cell metabolism is directly fed by orderly environmental magnetism. In other words - if the magnetism in your back yard makes a pretty rose like (fractal or labyrinth) pattern - then YOU and your roses - WILL BE BEAUTIFUL. On the other hand - if the magnetism in your back yard (or your city) is dizzy and tangled and bleeding loosely around the edges - then YOU and your roses WILL BOTH ALSO BE DIZZY. Look at the trees - the ones whose trunk is wrapping around in a twisted braid all the way up the tree - are always doing that only exactly at the places where the underground magnetism is coming up in JUST SUCH A TWIST. So good - now you have the basic idea. Make magnetic lines in pretty patterns - and life blossoms. So how do you do this? Well - this article is meant just to whet your appetite for the fun - and give you some more reading suggestions..(below).. But the basics are easy - stones that steer magnetism around into nice coherent waves - are called PARAmagnetic (limestone, quartz based, granitics etc,) - versus stones that break up magnetic lines like a sieve (FRACTIONATION instead of FRACTALITY) are called DI-magnetic (sandstone for example). Labyrinths - or anywhere magnetism can be taught to dimple and turn inside out - measureably help dyslexics, measurely feed attention span , and elminate geopathic zones. 1. 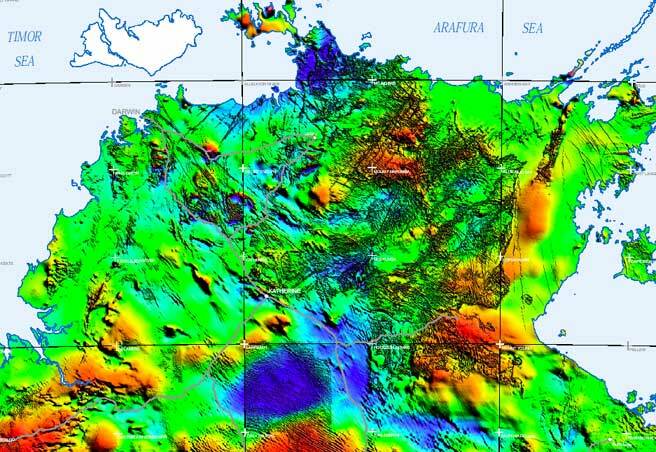 Team geo-physicists and dowsers to make uesable magnetic maps of key areas of your city. 3. Work diligently to reduce the use of heavy metal construction- so fatal to environmental health. (Simple example - the beautiful sacred space at Parthenon, Athens - has been disastrously bled of life force - just because the ignorant custodians chose to circle the place repeatedly with wire ropes to steer people around. The metal in wire ropes - bleeds so much of the charge and life from the site - it no longer fits the definition of SACRED (able to sustain charge as a wave). They need to choose paramagnetic or living materials. The problem with most metals when used in construction creating the feeling of death - is that their electron structure is far from fractal or self-similar (aluminum for example is insideously fatal) and then the bonds in the metal store only the record of painful heat - and not natural electrical charge - in context... ( see EMBED or die...). During bond formation the geometry of ambient charge is stored - if that moment is not embedded in biological sources of charge - like for example to highly man-made sources of electrical heat used to form aluminum - then those bond geometrics will radiate a charge whose symmetry is not - embedable- or out of phase with all life. This capacitive radiance geometry for example is the physics of astrology (gravity happens when charge implode accelerates due to self-similarity), and the kirlian photograph. Please see examples at - Good Feng Shui When Scientists Cross Ley Lines With Dowsers? 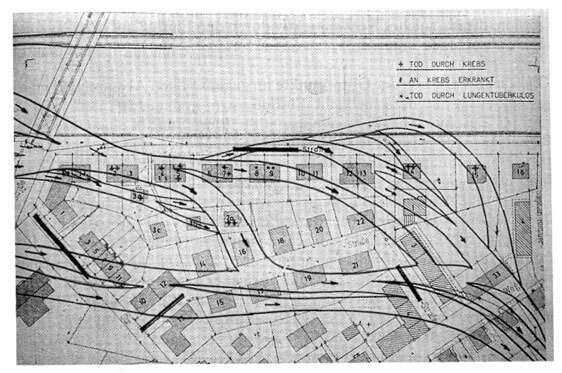 Above - the pictures of the undergroud water courses from the same Robert Endrös book: Translation of Caption: Fig 71 (p. 169), Residential area over powerful underground water courses. Since the making of this map another 4 people died of cancer. text in upper right corner, from top to bottom: Death by cancer. Sick of cancer. Death by lung tuberculosis. 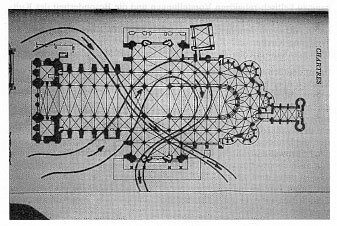 Mapping underground magnetics under Chartres..Translation of Caption:Chartres cathedral over underground water courses. GEOPATHIC ZONES PICKED UP - FOREST HEALTH AFFECTED BY HUMAN METALLIC IGNORANCE...? 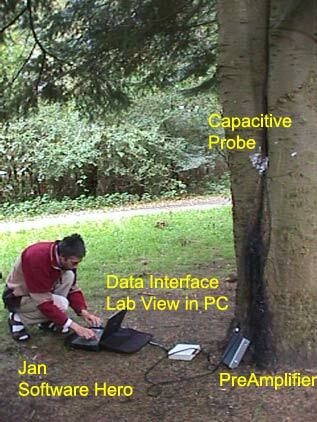 On this bottom plot below, it appeared that a strong 70 hz or so resonance of a large very metallic fence was strongly and negatively affecting the life force of the tree being measured. This appeared to be confirmed, when we checked the spectrum of emissions of the fence itself, and noted to apparent begin to rot of the trees the fence line pointed to. 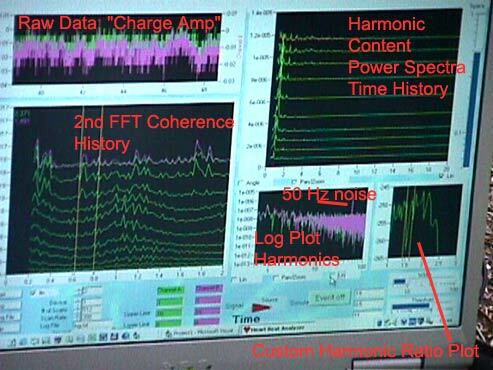 Note that the harmonic content of this foreign non-living frequency limits the spectral bandwidth AND THEREFOR THE LIFE OF THIS TREE..? 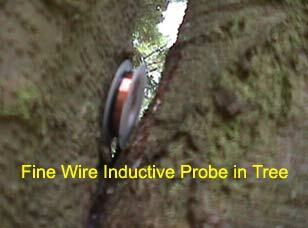 The inductive probe tells us when too much local 50 or 60 cycle noise will cover the true 'singing' of the tree, preparing to use capacitive 'Callahan Probe'. Here is a simple thing a city manager can do. He can rip the fatal soul-less flourescent lights and transformers out of ONE city class room - install sun-light and full spectrum lighting - and then MEASURE THE DRAMATIC INCREASE IN ATTENTION SPAN IN CHILDREN. Then change the whole city. The principle is that waves that EMBED with the Sun's fusion.. CREATE attention and awareness. Waves that are out of phase with this Sun's hydrogen fusion heart - FAIL TO EMBED - and (in this author's view) become the only definition EVIL ever had. Read how attention and peak experience are created when harmonics nest...musically: Raving About Musical Keys to Bliss: - How did Dan Winter's message - that BLISS is key to immune health - and biological sustainability - that BLISS has a musical recipe, and with some pure principles and optional HeartTuner biofeedback - can be SELF EMPOWERING .. without drugs.. Reach 5000 Young People recently in the Back Country outside Melbourne - Australia recently? Once you begin to get the idea that biological based sources of charge - actually fabricate areas where people can feel JOY - you can begin to take action in your city. A bee hive is an example of sacred architecture because it is a good ('dialectric') way to store biological charge. A refrigerator or your average metal city building is a terrible example of a biological capacitor because it bleeds charge all over the place, and would even measureably inhibit seed germination. Metal in square shapes is the worst way to try to create life. The Biodynamic (Steiner) student would only touch wood and stone and natural fabric.. The science behind this is excellent because these materials CAN bend charge and braid it with biological intent. If you would like to create urban environment which has the charge hygiene to permit BLISS and PEAK EXPERIENCE - we recommend this study of the SCIENCE behind FengShui and Geomancy. Geometry of Eldorado - Understanding A Country's National Destiny Based in the Sacred Geometry of Magnetic 'Long Waves"
Recursion in The Harmonic Power Spectra of the Earth's Magnetic Grid, Proves the Onset of Self-Awareness..
'Soft' Spot in the Earth's Head DIMPLES to be BORNE into The Solar Storm / Phirey Orgasmic Moment.... May 2000? 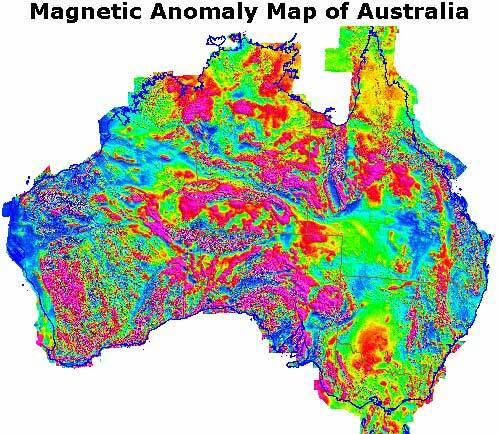 Why Does War Occur ONLY in Places Where Earth's Magnetic Resonance cannot Penetrate the Soil? David Yarrow's Articles, Intro to "Dragon in the Ice Castle"
Washington DC Magnetic Geometry: A "Pentagon" Fractal".. an Emotional Spin Radiance Source.. of Masonic Design?